Members of the football team gather around weight equipment prior to the start of Lift for Life. A member of the offense participates in one of the deadlift circuits. 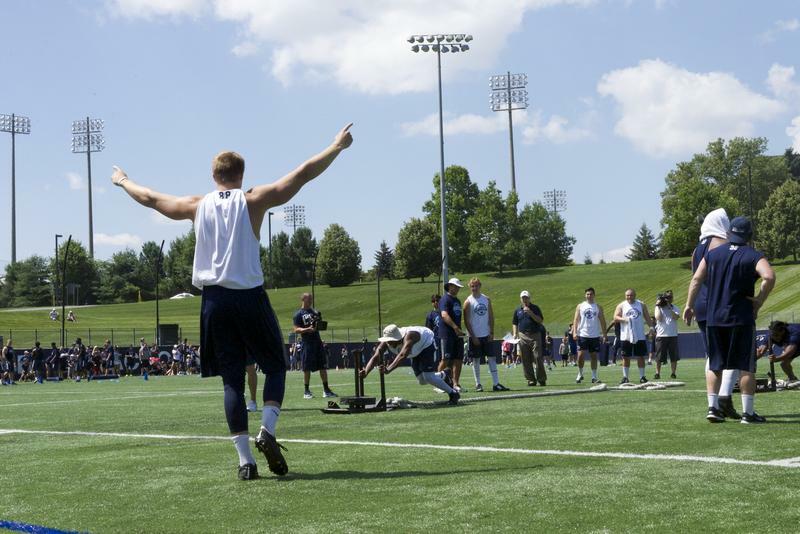 Tight end Mike Gesicki raises his arms in victory as his team pulls ahead in the sled pull relay. Members of the offensive line take a break and rest between events. 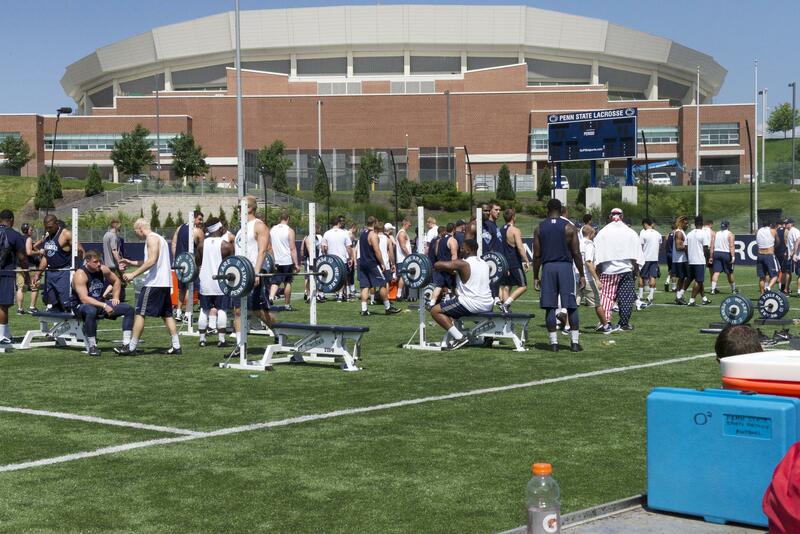 The football team looks on as two players compete to see who can perform the most reps on the equipment. 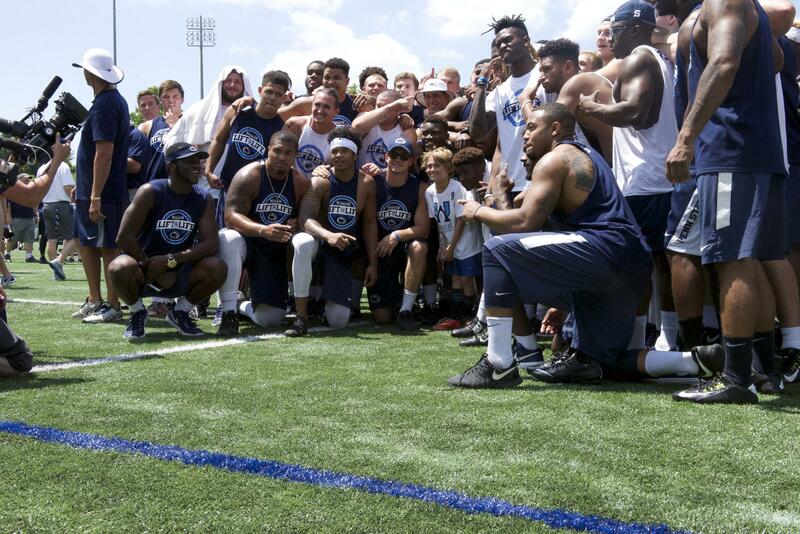 The players gather for a team photo at the conclusion of Lift for Life. 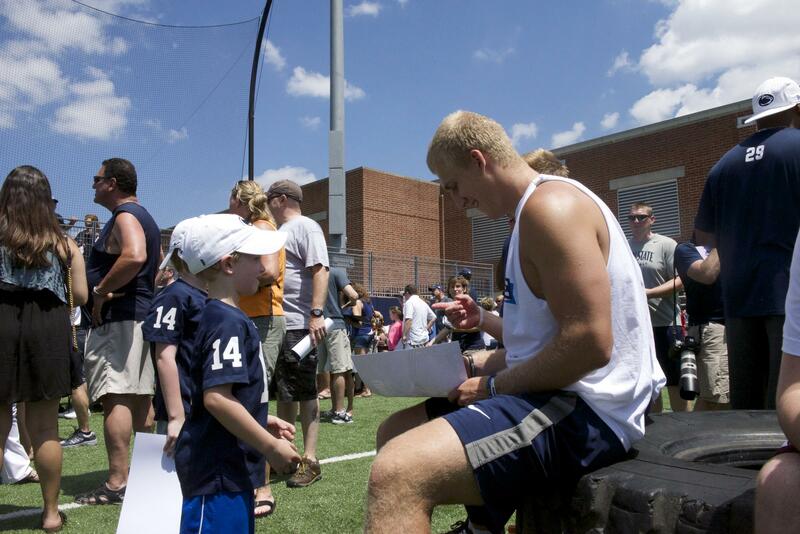 Adam Breneman, a tight end, signs an autograph for a young fan at the end of the event. The 2015 Central Pennsylvania Festival of the Arts was in full swing Saturday morning. But, in a northeast corner of the Penn State campus, the football team was in the middle of a workout under the hot sun. This workout was a little different than their normal conditioning routine. 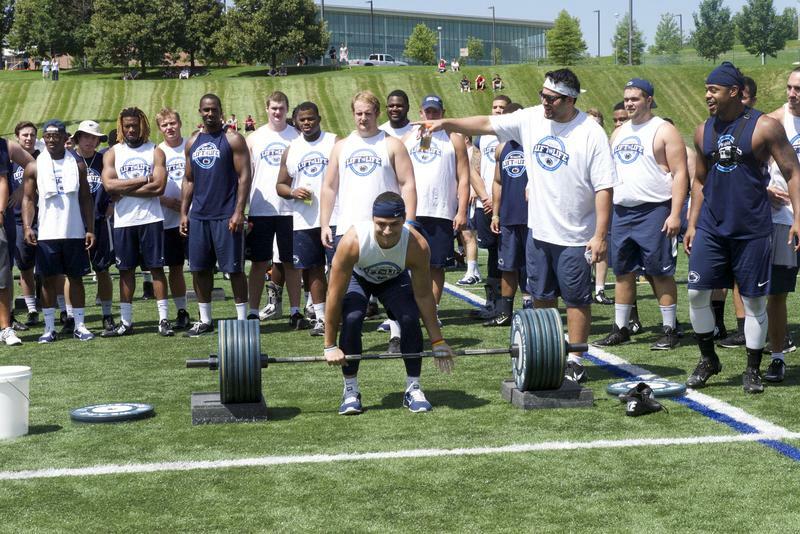 The offense competed against the defense in events such as sled pull relays, deadlifts, tugs-of-war and other strength exercises. 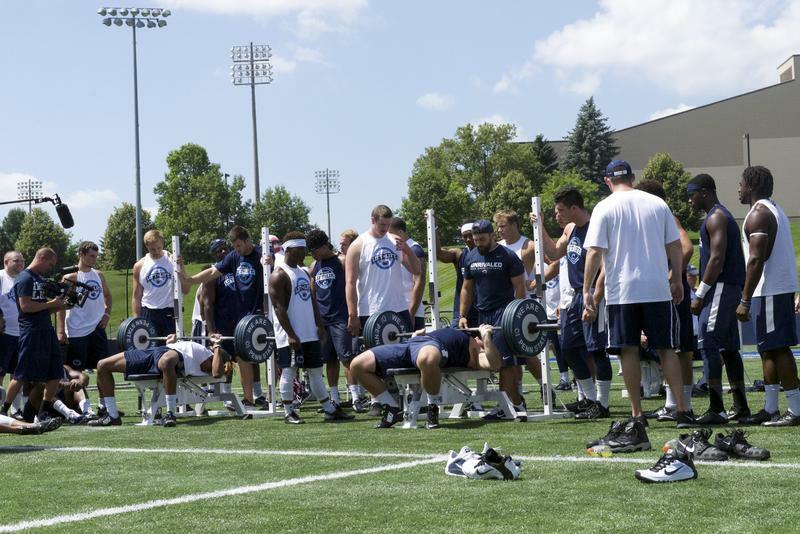 Fans, families and alumni packed the stands at the Penn State Lacrosse Field for the 2015 Lift for Life to watch the football team push the limits of their strength, all for a good cause. Lift for Life is an annual event organized by the Penn State chapter of Uplifting Athletes to raise money and awareness for the Kidney Cancer Association. 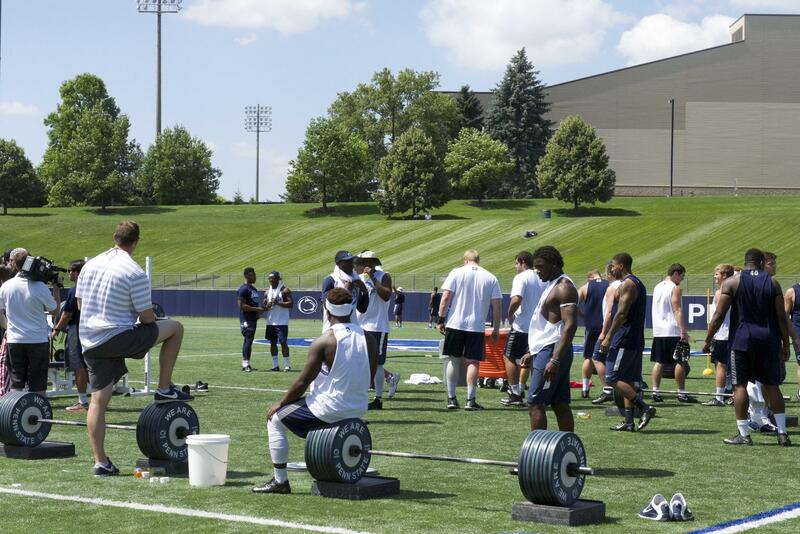 Scott Shirley, a former Penn State football player and the founder of Uplifting Athletes, organized the first Lift for Life in 2003 as a way to raise money and awareness for kidney cancer. Shirley’s father was battling kidney cancer at the time. Today, Uplifting Athletes is a national organization that is represented by at least one chapter in every football conference across the country. Each chapter supports research and awareness for a rare disease, which is any disease that affects 200,000 or fewer people annually. Saturday’s Lift for Life raised $119,303 for the Kidney Cancer Association. In 2014, the Penn State chapter of Uplifting Athletes passed the $1 million mark for total funds raised. The group is the largest annual donor to the Kidney Cancer Association. “I think it was amazing,” Carrie Konosky, the vice president of development for the Kidney Cancer Association, said of the event. Football players organize Lift for Life and other fundraising events throughout the year. Ben Kline, a linebacker and the president of the Penn State Uplifting Athletes chapter spoke to fans at the end of the event. The offense beat the defense in a close match of 31-30. Following the competition, the players held an autograph session for the fans in attendance as children ran across the field and interacted with the players.